From Amazon.com: On the outside, Dina Demille is the epitome of normal. She runs a quaint Victorian Bed and Breakfast in a small Texas town, owns a Shih Tzu named Beast, and is a perfect neighbor, whose biggest problem should be what to serve her guests for breakfast. 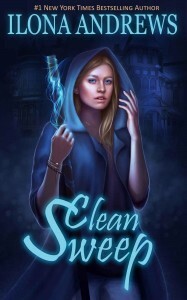 But Dina is…different: Her broom is a deadly weapon; her Inn is magic and thinks for itself. Meant to be a lodging for otherworldly visitors, the only permanent guest is a retired Galactic aristocrat who can’t leave the grounds because she’s responsible for the deaths of millions and someone might shoot her on sight. Under the circumstances, “normal” is a bit of a stretch for Dina. Why I recommend it: It’s a very charming story that spends a good deal of time on fascinating world-building and uses one of my favorite fantasy/supernatural tropes, the interdimensional innkeeper. I could hardly put the book down, and I can’t wait to return to the setting with the next installment in the series.